“Have you considered taking probiotics?” the doctor replied to my concern about stomach pain and upset with Tecfidera and with that my world has changed. I still get the occasional upset but not the pain I had before – though I must admit to only being back on the medication for a few weeks consistently with the probiotic supplement. Take them with or at the end of a meal. Acid found in the empty stomach can counter some of the flora in probiotics which is easily avoided if the user has just eaten. WebMD does caution that more research needs to be done on the use of probiotics by people with weak immune systems while at the same time stating the benefits for inflammation (immune response). WebMD. “Probiotic – Topic Overview”. http://www.webmd.com/digestive-disorders/tc/probiotics-topic-overview. September 2016. Pope, Sarah. 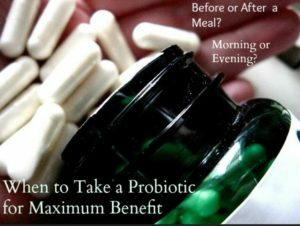 “How to Take Probiotics for Maximum Benefit”. The Healthy Home Economist. http://www.thehealthyhomeeconomist.com/how-to-take-probiotics. September 2016. Swanson, Lara. “When Should You Take Probiotics?”. http://probiotics101.probacto.com/when-should-you-take-probiotics/. August 2013.